The Department of Homeland Security took another step this week toward building President Donald Trump’s promised wall along the southern U.S. border. U.S. Customs and Border Protection said Thursday they’d awarded contracts to four companies to build prototypes for the stretch of the desired barrier made of non-concrete materials that can be seen through. The section of the wall that would face the U.S. is expected to be built with concrete and contracts for prototypes have already been given out, while officials imagine the stretch of wall facing Mexico would be built from “other materials” that would allow border security officials to see through it. What is the Real Cost of Trump's Wall? The latest prototypes will be between 18 and 30 feet high and must be made from material other than concrete, the agency said, but CBP spokesman Roger Maier wouldn’t comment on the kinds of materials that the winning companies might use. Construction of the prototypes is expected to begin in the coming weeks. The companies will then have 30 days to build them. 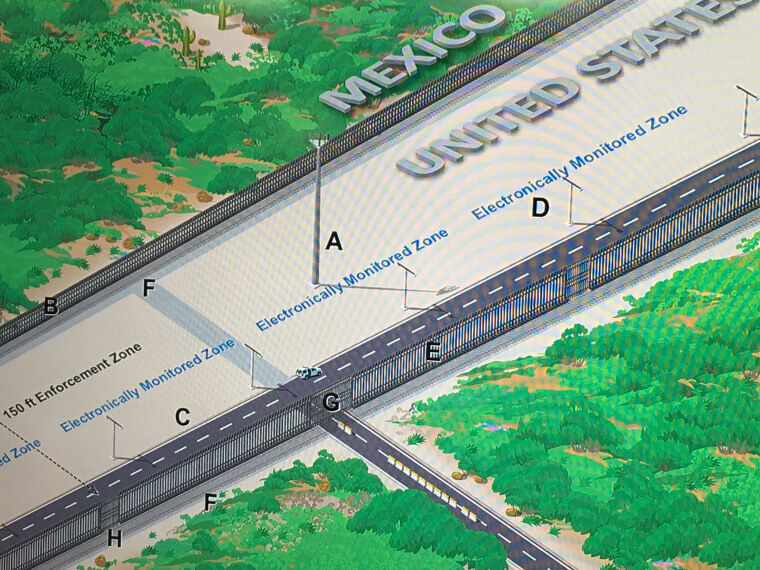 The image shows the concrete portion of the wall (E) would sit on the U.S.-facing side of an electronically monitored zone and another barrier (B) — which can be seen through — faces toward the Mexico. The monitoring zone would be about 150 feet wide and alert patrol agents if someone breached the initial border barrier. Each of the contracts is between $300,000 to $500,000, CBP's Maier told NBC News. Trump has explained that parts of the wall must be “transparent” so officials can see what’s happening on the Mexico side. "One of the things with the wall is you need transparency. You have to be able to see through it. In other words, if you can't see through that wall — so it could be a steel wall with openings, but you have to have openings because you have to see what's on the other side of the wall," he said in July. "And I'll give you an example. As horrible as it sounds, when they throw the large sacks of drugs over, and if you have people on the other side of the wall, you don't see them, they hit you on the head with 60 pounds of stuff? It's over. As crazy as that sounds, you need transparency through that wall. But we have some incredible designs," he said. Last week the agency announced the four companies that won contracts to build prototypes for the concrete portion of the wall. Caddell Construction and W.G Yates & Sons Construction won bids on both the concrete and non-concrete portions. The White House’s proposed 2018 budget seeks $1.8 billion to begin building new sections of the wall and replace existing ones. That would include money to build 28 miles of levee wall in the Rio Grande Valley and 14 miles of new wall to replace fences south of San Diego. White House officials have suggested that the entire wall project could cost between $8 and $12 billion, but internal DHS assessments suggest the cost could be higher — as much as $21 billion.